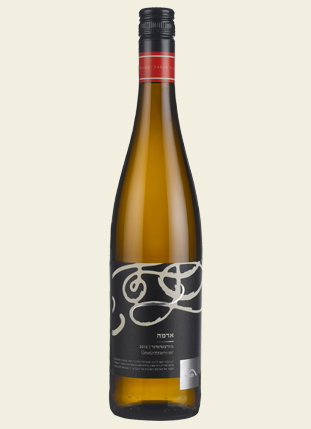 This wine, made from 100% Gewurztraminer grapes which are grown on Terra-Rossa soil on the winery’s vineyards at an elevation of 700 meters in the upper Galilee. When they reach optimal maturity in late August, the grapes are manually and selectively harvested in the early morning and pass a strict selection process once in the winery. The grapes are then gently separated from their stems and are pressed and left for 8 hours with their skin to optimize the aroma. Following this is a slow and controlled fermentation in stainless steel tanks, without disturbance from lactic acid or contact with wood. A designated strain of yeast is used to strengthen the unique characteristics of grape and the region of cultivation. The wine is rich, and harmoniously combines a crisp acidity with a subtle sweetness and contains aromas of rose petals, lychee, honey, and spices. The wine maintains a golden color with a slight glow of copper with a rich, lasting taste.